To most people, running is a punishment that causes the body a great deal of pain. To Greta Lindsley, it’s a hobby, a sport and a lifestyle. “I love to run and I like to work hard at practice,” said Lindsley. Ever since she was young, Lindsley has been an extraordinarily fast competitor. She ran for Pequea Elementary in the district fun run every year since kindergarten. While this event primarily focused on participation of students from the schools rather than the competition, Lindsley always placed in the top two of her grade. She had a strong rivalry with Eshleman’s Alisa Herr and the two girls battled for first place every year since kindergarten. Her inspiration to become a great runner comes from her father, Todd Lindsley, who ran track and field all the way through high school and college and is still a current record holder at the College of William and Mary. He has coached her ever since she was little by taking her running and teaching her a strong work ethic. He still pushes her to be the fastest she can be. 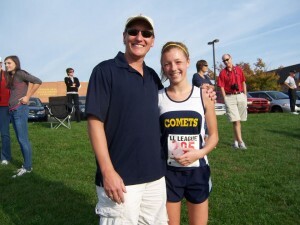 Lindsley, now in her sophomore year at Penn Manor, has just finished her second season of cross country for the Comets. Last season she was undefeated in league competition and was crowned the LL League Champion. 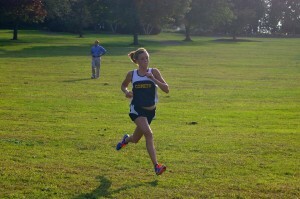 She placed fourth in districts and did not run in states because of an illness. This year, she remained unbeaten in the regular season and won the league title yet again. She finished first at Hershey and added a District Three Title to her resume. When states came around, she was healthy and eager to contend for the top spot. States was held at the same course as districts, so knowing the course helped her prepare for the big event. She concluded her season with an impressive eighth-place finish in her first-ever state appearance. This year she was also named to the 2011 Second All-State Cross Country Team. She was selected for this honor by a committee of the Pennsylvania Track and Field Coaches Association. The award was presented for her honors received, her quality and consistency of performance and her head to head competition. Greta Lindsley at full throttle down the final leg of a race. Photo by Caroline Lovett. Lindsley has ambitions to further her running career after high school. Even though she is too young to officially talk to any college coaches, she knows that she would like to continue the sport at the collegiate level. “I plan to hopefully be a helpful member on a collegiate cross country or track team,” she said. This star still has unbelievable potential for the remainder of her high school career. With her upperclassmen years around the corner, Penn Manor sports fans are eager to watch her continue to dominate in the future.